Farmed fish can look forward to exciting times ahead. Instead of fishmeal, algae, insects and mussels can end up in their diet. Cargill wants to help the aquaculture industry develop sustainably. ith 150,000 employees and business activities in over 70 countries, the US company Cargill is one of the world’s largest privately owned enterprises. In 2015, it acquired the fish feed producer EWOS. The company previously known as EWOS has now doubled in size and has a total of 2,000 people on its payroll. The new business unit for feed to the aquaculture industry, Cargill Aqua Nutrition, has operations in more than 20 countries. It is led from Bergen by Einar Wathne, who used to be CEO of EWOS. “Cargill is a giant, with a huge reservoir of knowledge and well-established value chains in other types of food production. And now it is focusing on aquaculture, where it sees a huge growth potential. It is an acknowledgement of the aquaculture competence that has been built up in Ocean City Bergen that the company’s head office has been located here,” says Wathne. Cargill is researching innovative new replacements for fishmeal and fish oil, which will enable the aquaculture industry to continue growing. A number of ingredients from agriculture and the food industry have already found their way into the feed, and other alternatives, such as algae, insects and products deriving from new aquaculture methods, are being evaluated. The company is an important partner in the algae pilot facility at Mongstad, which produces omega-3 fatty acids from algae. Cargill is also developing a new type of rapeseed oil, which could be ready for the market in 2020. This will give large parts of the world’s population better access to the important nutrient omega-3. “Nevertheless, fish oil will remain an important ingredient in salmon feed, as far as I can see,” says Wathne. Trimmings from the fish processing industry will be an increasingly important source of marine raw materials. In many ways, this is the ideal raw material because it makes use of resources that would otherwise simply be thrown away. This summer, Cargill Innovation Center’s new laboratory opened in Dirdal, Rogaland. 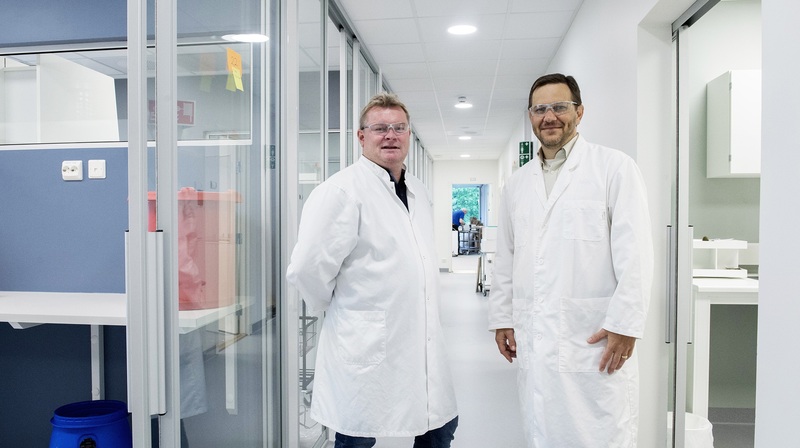 From the left: Karl Østerhus (Laboratory Manager) og Daniel Barziza (Global Aqua R&D Director). Next year, Cargill will move into a newly erected building at Marineholmen. Einar Wathne, who also chairs the NCE Seafood Innovation Cluster. Einar Wathne (right) is the CEO of Cargill Aqua Nutrition, which is headquartered in Bergen. Here he is together with Adel El-Mowafi, the international company’s Aquaculture Technology Application Director. of the world’s surface is covered by water, but only 2 per cent of the world’s food supplies, measured in energy, comes from fish and seafood. The combined mackerel quota in the North Sea, Skagerak and the Norwegian Sea totalled 895,000 tonnes in 2016. The value of Norwegian mackerel exports the year before came to NOK 3.8 billion.